Aurora faded into dawn as guides made their way to breakfast with respective groups of travelers. Then to launch and across the tundra. The sky soon became mostly cloudy all over the Churchill region. Pockets of bright blue sky opened up over Button Bay on the western side of Fort Prince of Wales across the Churchill River. No wind and temps around 24°F allow for prime wildlife viewing conditions. Meanwhile, our early morning helicopter journeys are already seeing upwards of 15 bears, five or six moose, and scattered caribou en route to Wapusk National Park(WPN) and a landing at Nester One; a bird banding and general research outpost just down east of Cape Churchill. Between there and Broad River, farther southwest, some groups also observed a fresh seal kill being enjoyed by another bear. Most sighted polar bears this season are in good shape due to last spring/summer’s late ice break-up but this animal wasn’t taking any chances, I guess. Back on the Tundra in the Churchill Wildlife Management Area (CWMA), Guide Jared reports having fantastic bears…more than yesterday. Easily, the highlight of the day as with Elise’s group yesterday, was a huge male on hind feet pressing his nose up against the front windshield! Windex anyone? This was proceeded by said male chasing a sow away from the vehicle….no sharing today. Another highlight for the group was a much smaller white Ermine out near Gordon Point. Without enough snow just yet they stand out against the red and brownish tundra and allow for good photographs. Both Guide Jared’s and Paul’s groups observed bears eating ripe Gooseberries off the tundra patchwork. It’s still not known why in Arctic regions the bears eat Gooseberries yet the geese eat Bearberries; but researchers hope to solve that one sooner than later. Moving on…Guide Paul’s group came upon a Horned Lark and numerous Snow Buntings across the land as well as around seven or so bears between Ptarmigan Alley and the coast. 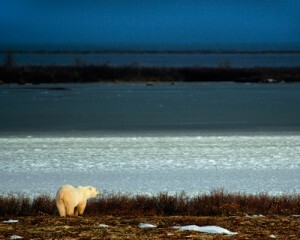 They finished off the afternoon observing a pair of sleeping bears close to the Tundra Lodge. Finally at and around the lodge itself, Guide Bonnie Chartier was able to find her avid birders five life-listers….a Snowy Owl, Horned Lark, Dunlin, Gyrfalcon, and amazingly, an immature Glaucous Gull resting on a frozen thermakarst (shallow pond) 100 meters away through the spotting scope. Guide Colby, also one of our Tundra Lodge guides, reports they have a resident bear out at the lodge patrolling the area weighing in at around 900 lbs. They’ve dubbed him “Rocky.” Ding!